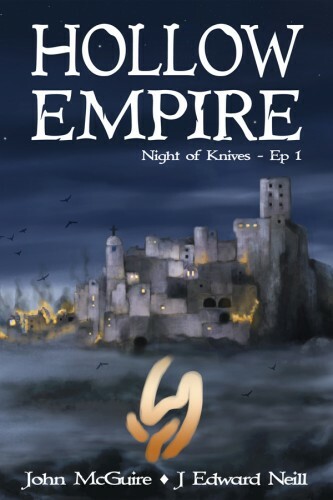 Ladies and gentlemen, Episode 1 of Hollow Empire – Night of Knives is now available on Amazon for only $0.99. Hollow Empire is co-authored by J Edward Neill and John R McGuire, the creators of Down the Dark Path and The Dark that Follows. Join Vadim, Nadya, Cassidy, and Murgul the Maggot as they struggle to survive in the aftermath of the world’s deepest, darkest plague, the Lichy. Hunted by aristocrats, chased by outlaws, sought after as supper for the vicious, zombie-like Iritul, the four survivors must fight for every moment of their lives. On the fence about Hollow Empire? Think post-apocalyptic medieval dark fantasy opera. Yeah. All of that. It’s deathy, dark, and terrifying, sprinkled with a bit of horror, a dash of western, and even a little extra superhero on the side. We’ll be releasing one episode per week, each for $0.99. Get in on this. You won’t regret it.